Bed size is 477mm 178mm, or 18.75" x 7" standard flatbed. Extra High Presser Foot Clearance up to 16mm or 5/8"
Juki 1541H means Heavy Duty feed dogs with fewer but larger teeth and bigger hole in foot and plate for heavier thread and larger size needles. Otherwise the 1541 and 1541H are the same. 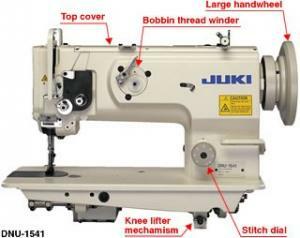 1541SC or 1541H-SC is Safety Clutch model which has a silver button to the right of the needle plate. When you hold the button down with your left index finger while turning the handwheel with your right hand, it will put the machine back in time in case it has been knocked out of time. Needle system is 135x17 upholstery. Maximum size is 24 which has the largest diameter and needle eye size for heavier threads. I was referred to you about the Brother PQ15000S by Dwyana and told me to speak with you about tech stuff and options. I'm looking for a straight stitch machine to make horse halters, dog collars, and straps so I need a commercial grade type to be able to sew through about .01 inches - .45 inches of nylon webbing / nylon polyesters? 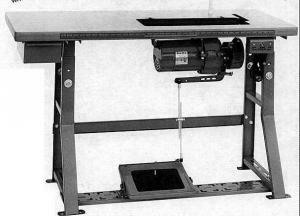 The Brother PQ1500 is an apparel fabric machine and you need an upholstery material machine with built in walking foot and maybe needle feed* to prevent slippage. for up to 1/4" material. 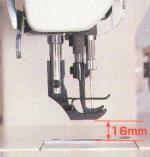 The best straight stitch Walking Foot Needle Feed (88) with Power Stand is Juki DNU1541 Walking Foot Needle Feed*, Big M Bobbin, 9mm Stitch Length, 9/16mmLift, SetUp PowerStand for up to 1/2" material. 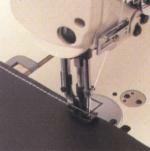 The best needles to sew through horse halters, dog collars, straps and .01 inches - .45 inches of nylon webbing / nylon polyesters is Organ Cool Sew size 20 up, which prevents heat build up in the eye and thread melting, shredding or breaking, which can be a problem with the dense materials you are sewing on.